In this video I reflect upon how Glasses helped further my own learning and the learning of my students. 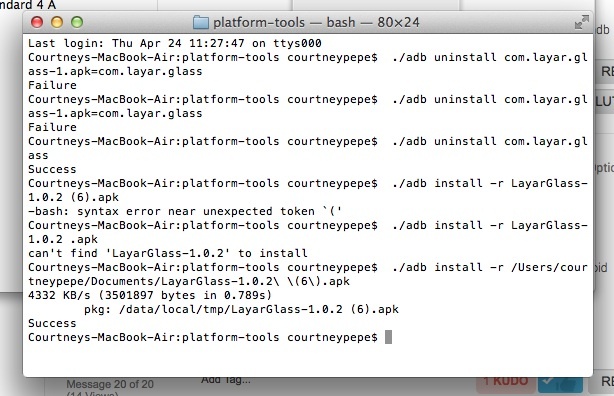 Today I had the daunting task of uninstalling an apk file to install an updated package. When I upgraded to XE 16 from XE 12 I lost my LAYAR augmented reality functionality. I was able to get the advice about what to do code/command wise thanks to the Google Glass Explorer Community. However, the best help I got was from one of my students who got onto my laptop, read all of the programming instructions and typed in the correct information to uninstall the old LAYAR package on the glasses and install the update. I just love it when my kids are smarter than me. I never see a student being better at me at a tech skill as something that I should be threatened by, rather I think it furthers my own learning. Thanks for your updates! It’s truly pleasant to see students are better than teachers. That’s why we need education.